(ASHRAE 2015). ASHRAE 188, an ANSI standard, was a giant step for Legionella prevention in the United States in part because it represented agreement among government agencies and industry groups—not only about the need for Legionella prevention in building water systems—but also about the approach to it. To comply with ASHRAE 188, building operators must implement a water management program (WMP) for water systems that can harbor and transmit Legionella bacteria. The essential components ASHRAE 188 requires for a WMP are almost identical to those the World Health Organization outlined in 2007 (WHO 2007) and the United States Veterans Health Administration (VHA) has required since 2014 (VHA 2014). 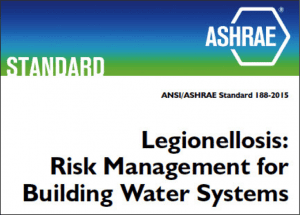 ANSI/ASHRAE Standard 188-2015 has received widespread industry publicity and is currently recognized as the prominent Legionella risk management document in the United States. “While opinions differ as to the role of routine periodic environmental monitoring, there is agreement that all health care facilities should have a control strategy in place” (Fields 2002). “CDC recommends a strategy based on proper maintenance of water systems” (Besser 2002). “Adoption of the ASHRAE guidelines [Guideline 12] could dramatically reduce the likelihood that legionellae will be amplified in a water system, thereby diminishing the risk of transmission” (Fields 2002). In 2003, the CDC published “Guidelines for Environmental Infection Control in Health-Care Facilities: Recommendations of CDC and the Healthcare Infection Control Practices Advisory Committee” (CDC 2003). Recommendations for water systems and devices are pages 125-133 (139-147 of the PDF). A report in Morbidity and Mortality Weekly Report (Garrison 2016) about a rise in Legionnaires’ disease cases and the need for better building water management. An updated version of its water management program toolkit (CDC 2017-toolkit). CMS requires the facilities to “Implement a water management program that considers the ASHRAE industry standard and the CDC toolkit, and includes…environmental testing for pathogens” but leaves the details of the program up to each facility. If you would like for your country’s document to appear in this list, please click here and enter the document title and URL link in the comments box. Veteran’s Health Administration (VHA) Prevention Of Healthcare-Associated Legionella Disease and Scald Injury from Potable Water Distribution Systems. Directive 1061 requires a written plan, control measures, and Legionella testing in plumbing systems for VA facilities where patients, guests, or residents stay overnight. Cooling Towers: See “Legionellosis: Best practices for control of Legionella” at www.cti.org. APSP/ANSI. 2009. American National Standard for Water Quality in Public Pools and Spas. Alexandria, VA: The Association of Pool and Spa Professionals. Available at www.apsp.org. HSE. 2017. The control of Legionella and other infectious agents in spa-pool systems. Health and Safety Executive. Sudbury, UK: HSE Books. Available for purchase at http://www.hse.gov.uk/pubns/books/hsg282.htm. ASHRAE. 1998. Legionellosis: Position Paper. Atlanta: American Society of Heating, Refrigerating and Air-Conditioning Engineers. ASHRAE. 2000. Minimizing the Risk of Legionellosis Associated with Building Water Systems. Atlanta: American Society of Heating, Refrigerating and Air-Conditioning Engineers. Available at https://www.techstreet.com/ashrae/standards/guideline-12-2000-minimizing-the-risk-of-legionellosis-associated-with-building-water-systems?ashrae_auth_token=&product_id=232891. Australian Government. 2015. Guidelines for Legionella Control in the Operation and Maintenance of Water Distribution Systems in Health and Aged Care Facilities. enHealth, Canberra. Available at https://www.health.gov.au/internet/main/publishing.nsf/content/A12B57E41EC9F326CA257BF0001F9E7D/$File/Guidelines-Legionella-control.pdf. CDC. 2003. Guidelines for Environmental Infection Control in Health-Care Facilities: Recommendations of CDC and the Healthcare Infection Control Practices Advisory Committee. Atlanta: Centers for Disease Control and Prevention. Available at http://www.cdc.gov/mmwr/preview/mmwrhtml/rr5210a1.htm. CDC. 2016. Legionnaires’ Disease: Use water management programs in buildings to help prevent outbreaks. Vital Signs, June. Atlanta: Centers for Disease Control and Prevention. Available at https://www.cdc.gov/vitalsigns/pdf/2016-06-vitalsigns.pdf. CDC. 2017. Legionnaires’ Disease: A problem for health care facilities. Vital Signs, June. Atlanta: Centers for Disease Control and Prevention. Available at https://www.cdc.gov/vitalsigns/pdf/2017-06-vitalsigns.pdf. CTI. 2008. 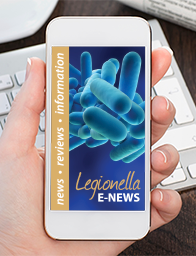 Legionellosis Guideline: Best Practices for Control of Legionella. Houston, TX: Cooling Technology Institute. EPA. 1999. 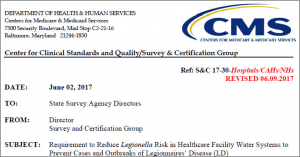 Legionella: Human Health Criteria Document. Washington, DC: U.S. Environmental Protection Agency. EPA-822-R-99-001, November 1999. EPA. 2001. Legionella: Drinking Water Health Advisory. Washington, DC: US Environmental Protection Agency. EPA-822-B-01-005, March. Available at https://www.epa.gov/sites/production/files/2015-10/documents/legionella-report.pdf. HSC (Health and Safety Commission). 2013. Legionnaires’ disease: The control of Legionella bacteria in water systems. Approved Code of Practice and Guidance (L8, fourth edition). Sudbury, U.K: HSE Books. Available at http://www.hse.gov.uk/pubns/priced/l8.pdf. HSC (Health and Safety Commission). 2013. Legionnaires’ disease: Technical guidance. Part 1: The control of legionella bacteria in evaporative cooling systems. Sudbury, U.K: HSE Books. Contains public sector information published by the Health and Safety Executive and licensed under the Open Government License. Available at http://www.hse.gov.uk/pUbns/priced/hsg274part1.pdf. HSC (Health and Safety Commission). 2013. Legionnaires’ disease: Part 2: The control of legionella bacteria in hot and cold water systems. Sudbury, U.K: HSE Books. Contains public sector information published by the Health and Safety Executive and licensed under the Open Government License. Available at http://www.hse.gov.uk/pUbns/priced/hsg274part2.pdf. HSC (Health and Safety Commission). 2013. Legionnaires’ disease: Technical guidance. Part 3: The control of legionella bacteria in other risk systems. Sudbury, U.K: HSE Books. Contains public sector information published by the Health and Safety Executive and licensed under the Open Government License. Available at http://www.hse.gov.uk/pUbns/priced/hsg274part3.pdf. OSHA. 1996. Technical Manual; Section II, Chapter 7. U.S. Department of Labor, Occupational Safety and Health Administration. Available at Available at http://www.osha.gov/dts/osta/otm/otm_iii/otm_iii_7.html. Soda E, Barskey A, Shah P, et al. 2017. Vital Signs: Health Care–Associated Legionnaires’ Disease Surveillance Data from 20 States and a Large Metropolitan Area — United States, 2015. Morbidity and Mortality Weekly Report. June 6. Available at https://www.cdc.gov/mmwr/volumes/66/wr/mm6622e1.htm. VHA. 2014. Prevention Of Healthcare-Associated Legionella Disease and Scald Injury from Potable Water Distribution Systems. VHA Directive 1061. Washington, DC: Department of Veterans Affairs. Available at https://www.va.gov/vhapublications/ViewPublication.asp?pub_ID=3033.